Inspired by the warm sea breezes and gentle waves of the Pacific Ocean, dermatologist Deborah H. Atkin, MD strives to provide general and cosmetic skin care that soothes and refreshes. Seeking to upgrade her practice website to reflect her approach to treatment, she reached out to our skilled team at Rosemont Media to help her realize this vision. In addition to crafting a site that reflected the beauty of the office location, she also requested an easily navigable layout that could be conveniently accessed from virtually any traditional and mobile device. Outfitted in soft sea greens and warm wood tones, the responsive website for Dermatology & Laser of Del Mar features the latest design elements while maintaining a simple, tranquil feeling. Along with abundant content on skin conditions and treatment options, a personalized online store makes shopping for professional-grade skin products a breeze. The frequently updated blog and display of patient reviews further assist current and prospective patients in achieving their skin care goals. 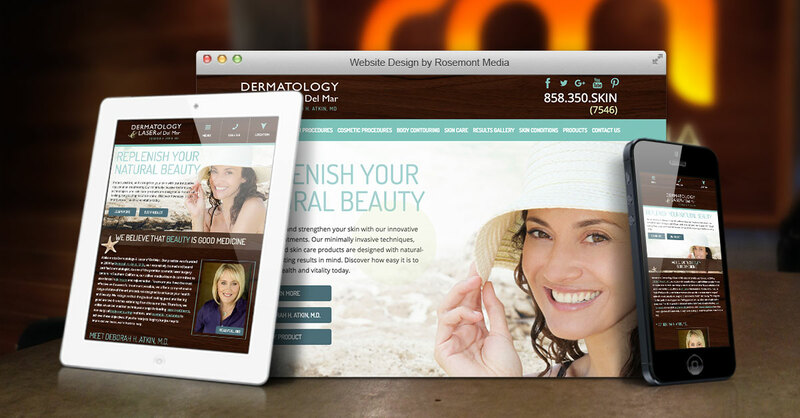 For a more in-depth introduction to the type of customized websites designed by Rosemont Media, please visit dermdelmar.com.